Keywords: Flooding, Exceedance, Attenuation, 2D Modelling, Sustainable. This is a research project (see Archive summary) which explores sustainable techniques of managing flood-waters which would otherwise exceed thresholds of loss. 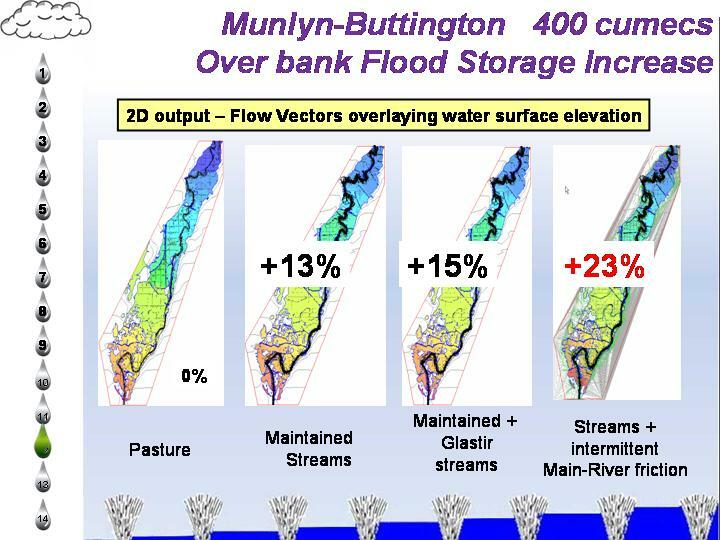 2D modelling of ‘Natural’ Flood Management (NFM) indicates that significant increases in reach scale storage (up to 1.3 million m3 in 5. 3 million m3) and flood-wave attenuation can be gained with minimal lateral impact on the floodplain wet perimeter. Such outcome adds hydraulic control to the Multiple Benefits of High Friction floodplains. The extent and form of porous floodplain structures are developed. The potential contribution of such ‘soft-engineered’ rural features to flood-risk reduction is demonstrated, and evidence presented, for particular consideration by statutory authorities, that such an approach is worthy of practical demonstration. Communities which flood are under particular threat both from weather extremes, and from the cumulative effect of past development. However, until the threat from flood damage translates into loss, construction of expensive ‘hard’ assets such as upland dams is unlikely to be resourced. Against this background, high friction floodplain features which attenuate flow and increase flood storage are of interest, particularly as, in lowland areas, riparian buffer strips are already promoted via government incentive and best practice guidance as environmentally beneficial. 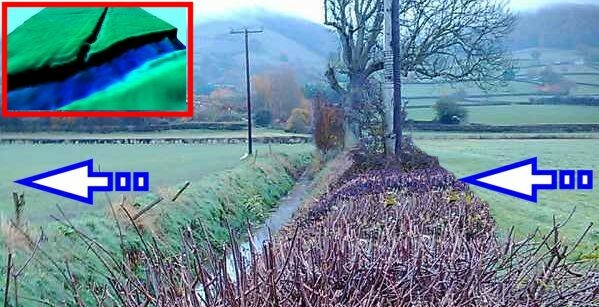 The research was carried out at the confluence of the Rivers Severn and Vyrnwy which lies on the Welsh/English national border in a productive alluvial valley dominated by flooding. A two dimensional model was constructed from both remotely sensed and survey data; and calibrated against hydrometric archives. Variable resolution point-clouds covering c.32 km2 were analysed by terrain feature and re-assembled in a modular condensed structure. This novel technique allowed not only land and flow surfaces to be discretized productively, but also model length, point-density and boundary conditions to be optimised for effective computation. Multiple experimental ‘broad-hedge-weirs’ (of dense, stiff vegetation) were introduced as features and their hydraulic performance was analysed in terms of both form and roughness. The effect of alternative weir configurations on attenuation storage volume was measured. 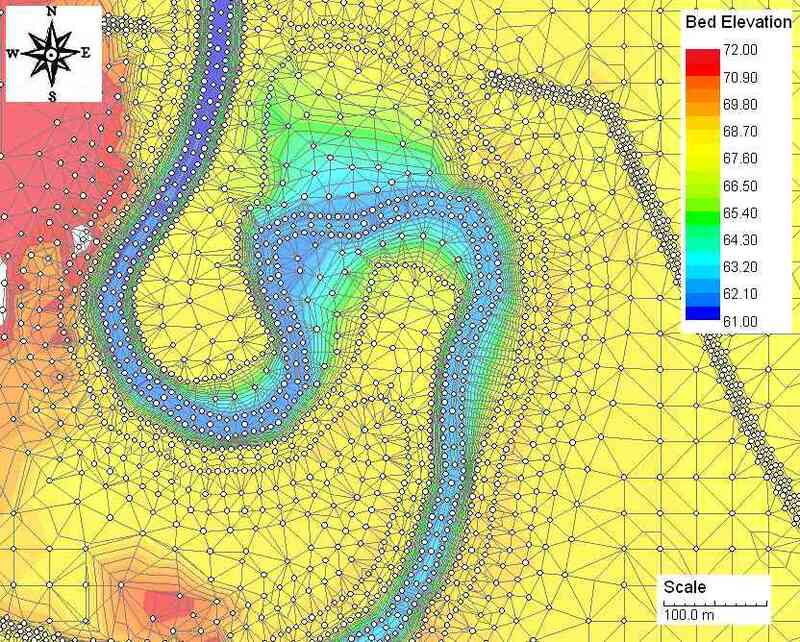 The handling and parameterization of flood plain roughness and boundary conditions in the ‘River2D’ model of Phase 1, whilst innovative and credible in respect of calibration, are relatively undeveloped. It is hoped that Phase 3 will see links to the streaming in real time of alternatively distributed models for effective comparison and for useful prediction of beneficial effect. Mr Whitworth has shown that his novel and timely proposal to increase flood plain storage and thus attenuate flood peak by means of by means of semi-pervious natural hedges across the flood plain has enough going for it to deserve being pursued thro’ pilots to a trial full-scale field trial. The proposal chimes happily with the current trend toward natural, environmentally-acceptable catchment management techniques. The Environment Agency initiative announced by the Minister in March 2011 whereby a number of pilot catchments would be supported appears to be a serendipitous means by which Mr Whitworth’s work could be continued.